The Ether Dome, located on the fourth floor of the Bulfinch Building, is frequently used for lectures, meetings, and presentations. When not it use, it is open for self-guided tours. Flanking “Ether Day 1846” painted by Warren and Lucia Prosperi are: Apollo Belvedere; collections of original surgical instruments; the mummy, Padihershef, and the mummy’s case. Student holding a Morton Etherizer replica during a Community Outreach Event. 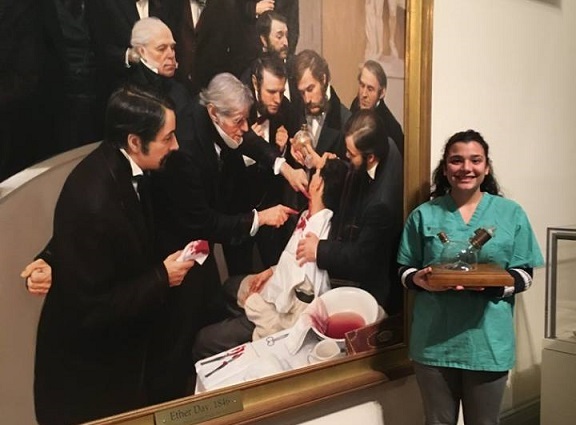 The Community Outreach Program offered by the Department of Anesthesia, Critical Care and Pain Medicine (DACCPM) at Massachusetts General Hospital aims to foster a love for science, technology, engineering and math (STEM) within the diverse communities we serve. Our mission is to inspire students to further their education in these subjects, identify potential careers within these fields and see Mass General as a resource for future opportunities. The Ether Dome continues to represent a central place for learning at MGH. Shown here is a one innovative teaching method-healthcare simulation, provided by the MGH Learning Laboratory. Simulation is used throughout the health professions for teaching and assessing cognitive, communication, and procedural skills.